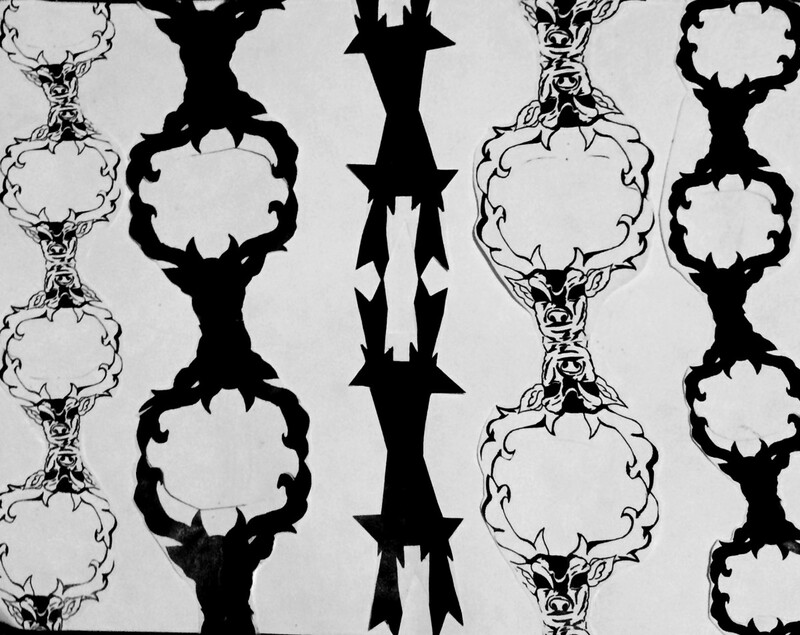 This final design is a result of countless hours of drawing, cutting and re-printing the same silhouette. First we had to come up with a naturally symmetrical influence that eventually lead to finding animals to be very symmetric. The animal that was in my favor is the deer, which truly is very symmetrical, due to its antlers. The original picture i used was of a deer found at a wild reserve in the USA, which i tried to draw, but i had put in much more shadow work. We ha also created a silhouette based on the image and then gradually created a geometric rendition, which lead to an abstract shape with no actual connection to the animal itself. For the final piece that is seen here I had tried to incorporate all four of the aspects into one symmetrical pattern, where mine is to resemble a chain linked with deer head to head causing a lot of negative shape work.